The American Academy of Dental Sleep Medicine (AADSM) promotes research and the clinical use of oral appliances and upper airway surgery for the treatment of sleep-related breathing disorders (SBD) and provides training and resources for those who work directly with patients. AADSM members collaborate with colleagues to learn about oral appliances and the role they play in the treatment of SBD. The organization builds bridges and forms relationships with the medical community, especially in sleep centers, and other professional groups who play an integral part of the SBD treatment and research team. The AADSM also reaches out to the community at large, working toward the creation of a positive public awareness of sleep disorders and the role of the dentist in recognition and treatment of SBD. The AADSM helps educate practitioner dentists through clinical meetings that keep leading-edge ideas accessible and establishes and maintains appropriate treatment protocol. It is the intention and mandate of the AADSM to address the issues of dental sleep medicine through the results of evidence based research. Established in 1991, the American Academy of Dental Sleep Medicine is the largest professional association that represents dental and medical practitioners treating sleepdisordered breathing with oral appliance therapy and upper-airway surgery. The American Academy of Sleep Medicine recommends oral appliance therapy for the treatment of patients with mild to moderate sleep apnea who cannot tolerate Continuous Positive Airway Pressure (CPAP), the standard treatment therapy, or who cannot use weight loss or positional therapy to treat their apnea. 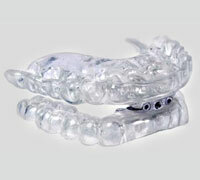 The Academy also recommends oral appliance therapy for severe sleep apnea patients who cannot tolerate CPAP. The AADSM provides educational programs, peerreviewed research and professional services to an evergrowing number of medical and dental professionals who treat obstructive sleep apnea. The Academy advocates for oral appliance therapy and upper-airway surgery in the medical and dental communities and the public sector. The Academy also fosters relationships with the medical community to further sleep-disordered breathing research and treatment. The Academy serves as a common platform for professionals from a wide spectrum of specialties, including general dentistry, orthodontics, prosthodontics, oral and maxillofacial surgery, periodontics, endodontics, oral and facial pain, sleep medicine, neurology, pulmonology and cardiology. These professionals gather to discuss ideas, develop methodologies, promote education and stimulate research related to dental sleep medicine.